Have you ever wondered what the ocean floor looks like? The National Oceanic and Atmospheric Administration (NOAA) did, too. 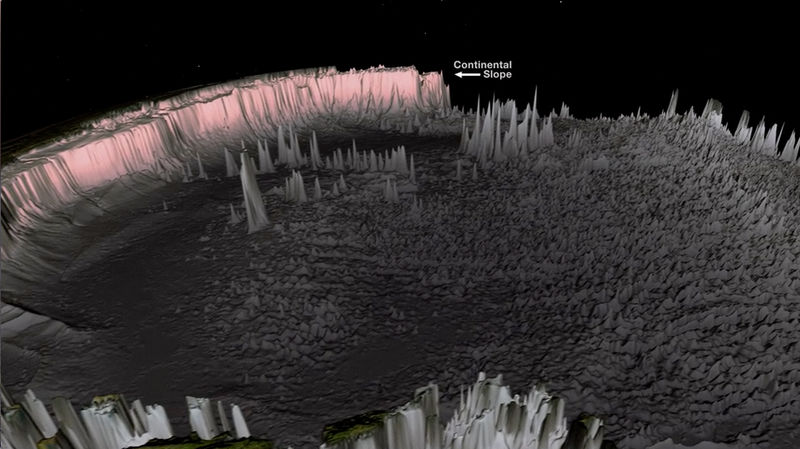 So they compiled gobs of data and maps generated by ships and satellites to create this amazing animation. On your tour of the dynamic ocean floor, you’ll soar over undersea mountain ranges, deep rifts, shifting plates, and even the resting place of the doomed Titanic. Satellites can illustrate the ocean floor from space by sensing the minute gravitational changes that pull, push, and bulge the ocean surface. Ship measurements can then augment the maps with even greater detail. This study of underwater depth is called bathymetry. Bathymetric maps are important navigational tools, as well as really cool graphics.